DJR Team Penske’s expectations are measured heading to Phillip Island, as the team looks to overcome braking issues that have plagued the Ford Falcon FG Xs. A new rule implemented this weekend means teams cannot change brakes from qualifying onwards, which DJR Team Penske managing director Ryan Story says could prove an “interesting challenge”. The rule is applicable at the WD-40 Phillip Island SuperSprint, Winton and Sydney Motorsport Park events, and is expected to save teams one set of rotors and pads per event. 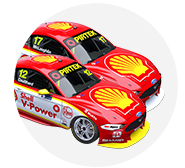 While DJR Team Penske has shown early pace with pole positions and Fabian Coulthard’s top three finish at the grand prix, last event in Tasmania highlighted the brake issue. “What we are doing is relying on the brake to turn the car,” Story explained. “So you are taking a lot more bite out of the brake and they are glazing up and all the other sorts of things that basically take the life out of them. For Coulthard, it has proven a key difference to the Brad Jones Racing Holden Commodore he is used to steering. “It’s all related to what we continue to talk about and that’s getting the car to turn. That’s something he’s spoken about quite a lot, that being a fundamental difference to what he has had in past years compared to what he has now,” Story explained. “And we see that a lot with the Fords. We are not quite as strong in the slower speed stuff as we are on the faster stuff. Story believes the issue isn’t specific to their FG Xs. “It’s a fairly consistent thing across all the Fords I think you will find. “It’s something that we have spoken about at length, because it is something that Marcos [Ambrose] picked up when he first got in the car and it’s been something for our team in particular that we have been thinking about for quite a while. “With the FG X package there are some pretty impressive strengths but unfortunately the weaknesses are fairly telling as well. “It does make it a challenge, but it is an engineering process that we have to work through to try and understand how best to address it. This weekend, Story believes DJR Team Penske will be in the mix and improve on its showing in Tasmania. “I think we will be better because it is a completely different style of circuit. “Basically, what we find is the inherent factor with the Ford is that we are not that flash on slow speed stuff and fortunately there are enough fast turns at Phillip Island that it should balance out reasonably well. “We will play to the strengths of the package and hope we will roll out in a similarly competitive fashion to where we were last year. The team runs a Pirtek livery this weekend, a flashback to Ambrose’s championship winning days in a V8 Supercar.